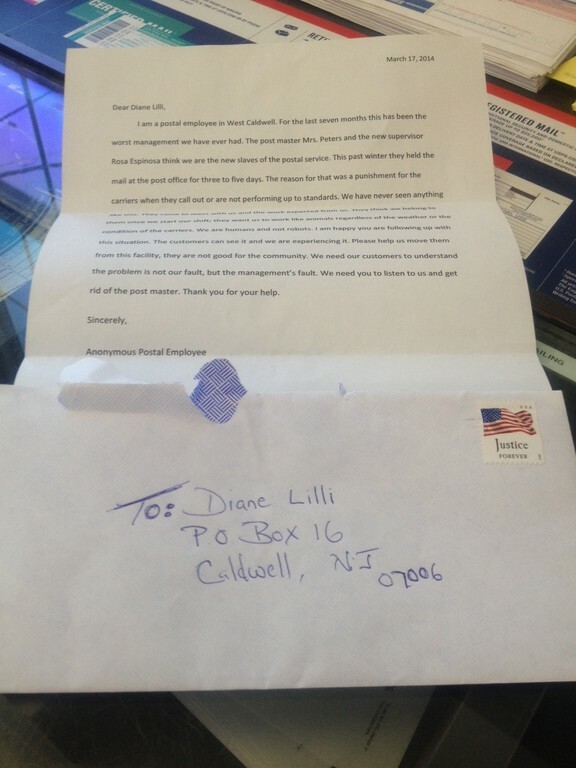 Yesterday, when I checked my p.o.box for mail, I had a letter with no return address. It was mailed, and the following letter is being published in its entirety. Last week, I wrote two articles, both noting the reports from local postal workers of being overworked and also working in a negative and allegedly harassing work atmosphere. Click here for last update on this post office crisis and click here for the first published piece. The articles went viral, and over 75,000 readers from across the United States commented and read them via my paper, Fark.com and other sites. Now, Congressman Rodney Frelingheysun has promised to follow up with the Washington D.C. postmaster. And, my personal Facebook messages are crowded with many many more issues concerning the mail in the Caldwells and Essex Fells.